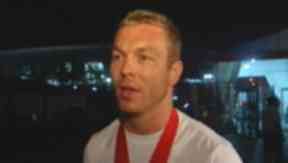 We discuss the achievements of Sir Chris Hoy who has become the most successful British Olympian of all time. Sir Chris Hoy has became the most successful British Olympian of all time after winning his sixth Olympic gold medal at London 2012. The flying Scotsman added to his medal collection on the final day of velodrome action having won a fifth goldalongside Philip Hindes and Jason Kenny in a world record time of 42.6 seconds in the team sprint. On Scotland Tonight, we discussed just what makes the Sir Chris so special in the world of track cycling. Former World champion cyclist Graeme Obree and record-breaking long-distance British cyclist Mark Beaumont offered their views on what makes Sir Chris so exceptional. Graeme said: "It doesn't get any better than that and there's more events to come up. "It was absolutely incredible because it was neck-and-neck and that first lap is so vital. "It's one of those events that the public don't really realise, you can ruin that event with one pedal stroke. If you mess up that starting gate and lose half a second then the race is effectively over." Mark added: "For the wider public who don't follow cycling all the time, they might just assume that Chris is unbeatable because every time the Olympics comes around he seems to get a clean sweep but that's not the case at all. "He has had his setbacks with injuries..but he's just came back in the nick of time and he's on a gold winning streak again."